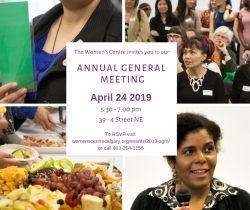 You’re invited to the Women’s Centre of Calgary’s 2019 Annual General Meeting! Join us on April 24 from 5:30 – 7:00 pm to celebrate another year of women supporting communities and communities supporting women. We’ll have refreshments, entertainment, and a chance to look back on some of our accomplishments in the year gone by. This event is open to everyone! Donations of personal care items for women in our community will be gratefully accepted. If you plan to attend, please RSVP below.